Connect to the WebMail interface. 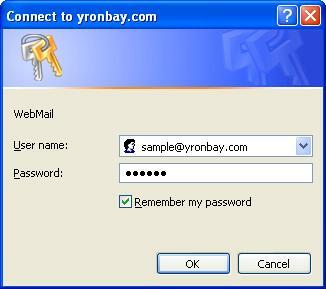 Usually this is reached by pointing your web browser to http://yourdomain/webmail/, where 'yourdomain' is the name of your domain (in this example it is yronbay.com). Note that the trailing slash here is critical - without it you'll receive an error page. You should receive an initial login prompt. Enter your full email id as the user name. You should then be presented with a selection menu of 2 different mail packages, horde and SquirrelMail. You may use either of these, although Horde is more popular as it is more Outlook like. Note that below the mail options are links which will let you change your password and set up forwarding and autoresponders. The following images show a few examples of using the Horde mail interface. Upon selecting that option you will see the login for Horde Mail. 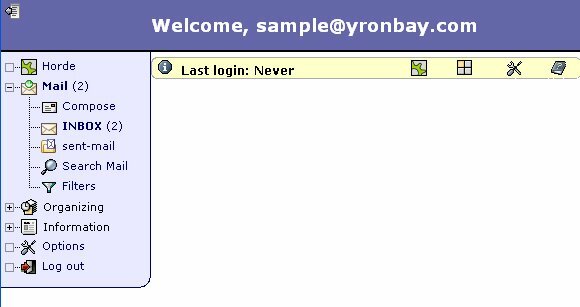 Click on the 'Log in' button to proceed. At the welcome screen, you'll notice a navigation bar along the left side. The little boxes with '+' signs in them indicate that they can be expanded to show submenus. Click on 'Inbox' to display your inbound mail queue. The number to the right of 'INBOX' (if present) indicates how many new messages are waiting. Shown below is an example of an Inbox screen. To read a message simply click on the subject or 'From' id. If you delete notes, they will simply appear with a strike-through line. To permanently delete (and free up your server disk space) you must click on 'Purge Deleted'. Always be sure to log out of Horde when you are finished (note the command at the bottom of the lefthand navigation pane). Note 1: Use this area to add attachments to your note. Click the 'Browse' button to select the files on your pc you wish to attach. Then click the 'Attach' button to upload the files. The 'Message Composition' window will open in a new browser window and you may not notice this area at the bottom of the note. It may be necessary to use the scroll bar on the right side to move the window down to the Attachments area. Note 2: This button will show the status of attached files. It is only functional once you have attached a file per the instructions under Note 1. 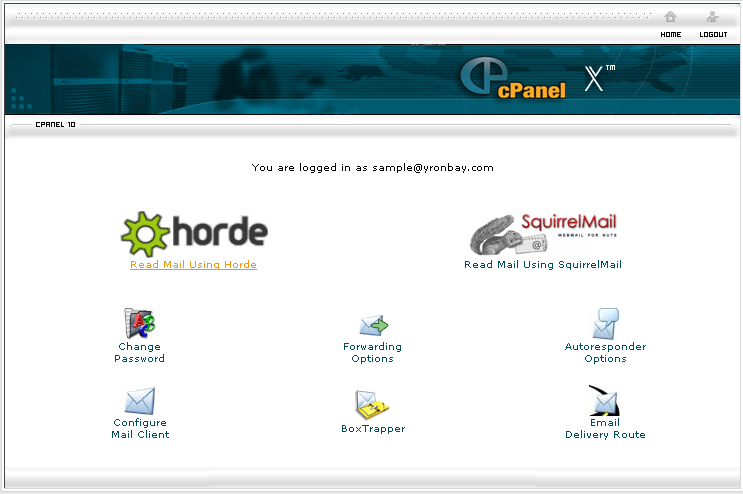 Horde is a full-featured e-mail application. The text below describes the main buttons in Horde and what they do. This is provided as a summary reference, and not a detailed description of how to use Horde. If you are not sure how to use some of the features, perhaps the Horde home page can help. - Displays your inbox with all your current mail that has not been viewed, moved, or deleted. - Write a new e-mail message. 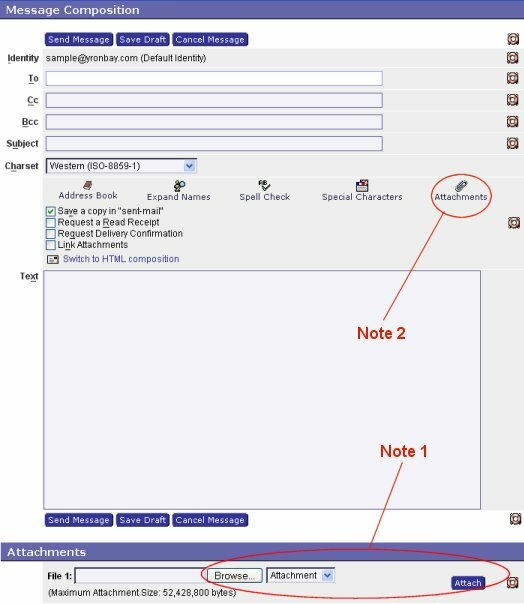 There are several options available, such as using an address book to choose the recipient(s) of your e-mail, adding attachments, and using special characters in the e-mail. - Organize your mail messages into different folders. You can have as many different folder as you want. 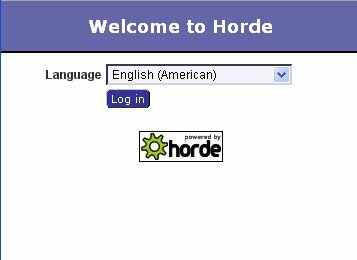 - Set a large number of options on how you use Horde. Please read the description of a setting carefully before applying it. - Search for a particular e-mail message. You can search by any field in the e-mail and search through any folder. - Displays the Horde online help. Please read this help when you have any questions or problems. You should always log out of Horde whenever you are finished. The 'log out' button can be found at the bottom of the lefthand navigation pane. 'Calendar' - Displays a calendar on which you can enter events.